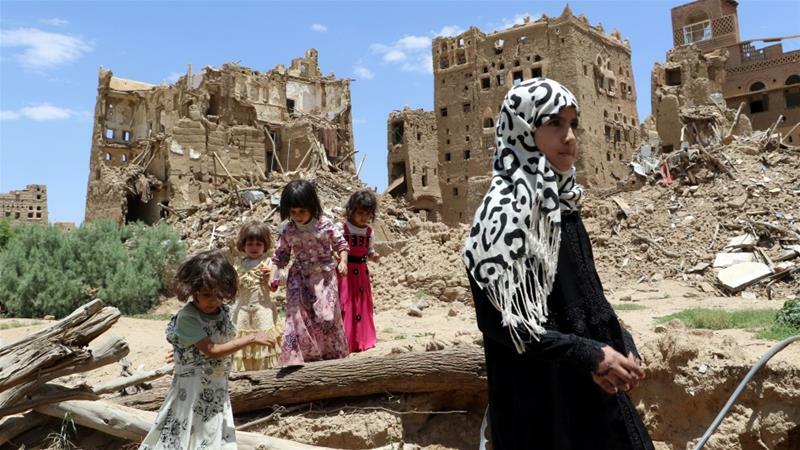 *Already the poorest Arab state, Yemen has been facing nothing but more destruction and starvation since the Saudi-led coalition’s military intervention began in 2015 following the takeover of Sanaa by the Houthi-Saleh alliance in 2014. Between Saudi Arabia’s disastrous strategies, the UAE’s divergent hidden agenda, and Houthis’ aggression, civilians in Yemen are paying the heaviest price of an unwinnable war. The fact that Houthis are neither outsiders nor easy to identify, as well as the rough nature of Yemen’s geography make this war impossible for either side to win militarily. After about four years of world leaders’ apathy over the atrocities in Yemen, at the end of 2018, the international community truly pressured the warring parties to come and sit at the table for the first peace talks in two years. The tragic killing of Saudi journalist Jamal Khashoggi represented a tipping point in the drive toward peace talks. The result was a moment of hope that there could be an end in sight to the war. As the weeks passed, however, it became clear that the talks were a result of international will but not necessarily a local or a regional one. Hope slowly vanished. It might take another major event with an international echo to bring that hope back. *This commentary was written for & first published on Carnegie Endowment oragnization's website April 10th, 2019. Women in Sana'a are reportedly banned from travelling without males' guardianship across Houthi-controlled areas. The decision was issued by Houthis, last month, according to journalist Fatima al-Aghbari. Fatima knew about the issue when she tried to book herself a bus ticket to travel from Sana'a to Aden. She was not allowed to book the ticket unless her brother booked it for her. I wrote this piece for Daraj in Arabic about the issue. Middle East Research and Information Project (MERIP) was one of the great publications I used to cite during writing my M.A. thesis back in 2015. Never imagined that I'd be published there - big thank you to dr Stacey for believing in the value of my work & for her excellent editing. Subscribe to read this essay! MERIP has been a great source of critical analysis & coverage of the Middle East for nearly 50 years. During the Global Conference on Yemen run by Center on National Security at Fordham Law School & Tawakkol Karman Foundation, in New York City, 7th of March, 2019, this session addressed the humanitarian crisis & its impact on the ground. 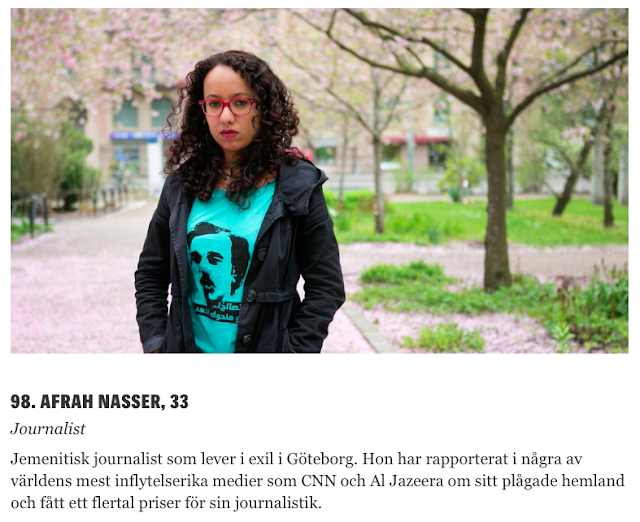 I am humbled to be featured among some of Sweden's top 100 influential women. The 75-year old newspaper reminds us that Sweden could celebrate multi-national Swedes & ensure that a Yemeni refugee like me is welcomed to be the Swede-Ethio-Yemeni she wants to be.